Two large circles have the same radius. Inside each circle, a shaded disk changes size in some simple fashion. "Simple Fashion" means some size parameter changes at a constant rate. However what is "simple" for Blue may not be simple for Green. Animate the size changes. Try to identify what aspect of the Blue disk changes at a constant rate AND try to do the same for the Green disk. 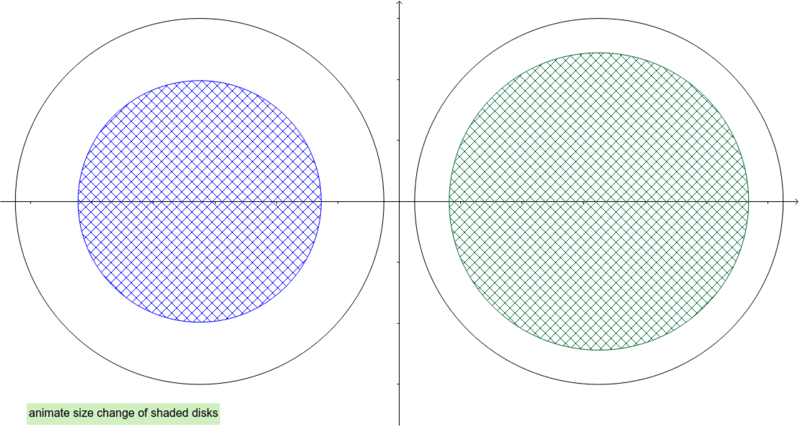 After doing those identifications for both disks, then write plausible functions for each disk that compute "standard size parameters" as functions of a time variable.